over the next ten years." telephone survey. Dr. Ira M.
ty of Miami directed the study. County will be closed Oct.
overall goal of $18 million,"
order to achieve its goals. craft. The Lavi project was cancelled by the government in August. test flights by the middle of next year. for us,' stated Mrs. Levy. Center in the Jewish Community Center. Dr. Elliot Klorfein and Dr.
ing was Dr. William J.
i nairman of the dinner. and how it would be organized. one side of the rivalry alone,"
Board of Palms West Hospital. For more information, contact Faye Stoller. Known as YWYMHA's in many communities. more than 10 years from now. couldn't you cut a few?" ing for oil in ANWR. being imported to the U.S."
safeguards should win the day. blackmail a decade from now. figures present at the meeting. tion of the play "the Deputy"
Combined Jewish Appeal-Jewish Federation of Palm Beach County. Inc.. Officers President. Erwin H Blonder; Vice Presidents. Barry S Berg. Alec Engelstein. Lionel Grrtenbaum. Marva Perrln. Marvm S Rosen Treasurer. Helen G Hoffman. Assistant Treasurer. Gilbert S. Messing. Secretary. it not guarantee Kashruth of Merchandise Advertised. in full on its own." of Pius XII is a very poor one." way" Pius would be cleared. I* Succot (the Season of Plenty) is the Jewish Festival that commemorates time of joy for the Jewish people. for humanity to harvest its dreams of freedom and peace. It's what makes us Jews. Kenneth J Lassman, F.D.. General Manager Douglas Lazarus, F.D.. V.P. Allan G. Brestin, F.D. Edward M. Doom, F.D. features music, comedy, and news. Regency Spa through Oct. 12. Center, Young Singles Dance at The Hyatt, 9 p.m.
Temple Beth El, Seminar "Human Sexuality" 11:30 a.m.
Federation, Board Retreat, 9:30 a.m.-3:30 p.m.
Women's American ORT-Palm Beach, board, 9:45 a.m.
Federation, Women's Division Regional Swing Ft.
during the final weeks of World War II. Organization, a United Nations agency based here. tion rate plummeted from 185 percent to 20 percent. sky's name was on that list. would be allowed to leave. daughter, Dora, born this May. visas so that they could emigrate to Israel. this community's dedicated efforts on their behalf. optional sleeping accommodations are also available. The Auto Train loaves each afternoon from Sanford, near Orlando. cious full-course buffet dinner and a tasty continental breakfast. Kosher meals are available if you let us know in advance. Make your reservations now to take advantage of the best rates. Call your travel agent or call Amtrak at 1 800-USA-RAIL. Amtrak's Auto Train. The ride that saves you 9O0 miles of driving. containing one or more Jews. their 5 percent," stated Mr.
part of the overall findings,"
is a gigantic step forward,"
scrap of paper in each pocket. its aroma. We "live in booths"
words of the Living God." choice of valued, a way of life. between Haifa and Tel Aviv. Over the past five years, Mr.
in Hebrew for the first year. Americans and Canadians in Israel. ing a period of relative price and exchange rate stability. the figures he presented are very realistic," stated Mr.
bringing family members to Israel for a visit. varies widely and is based on location, size, condition, etc. SUNDAY OCTOBER 18 3:00-5:00 P.M.
the cost could be saved. carried in the U.S. may still apply. clothes shopping while on a visit to the U.S.
the budget is reduced by approximately $100 per month. Office, 21 Washington Street, Jerusalem 94187. U.S. three of four times a year. ride from Megido to his home in Kibbutz Ramot Menashe. they witnessed the crime and identified him as the killer. a mere footnote to the history of World War II. U.S.A., succeeding Donna Green of Carlsbad, Calif.
Ronzoni Sono Buoni-Ronzoni Is So Good. ed and its release was an error. ning Council on the same date. Birds Eye Deluxe Vegetables. -Sugar Snap"
Btrds E&fDeUtxm. Ohmer will never be the same. 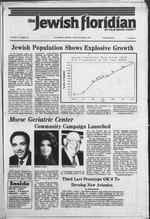 Page 12 The Jewish Floridian of Palm Beach County/Friday, October 9, 198? a.m. $10 for four sessions. 14 through Nov. 4, at 1:30 p.m.
Tuesday, Oct 13 through Nov.
Thursday, Oct. 22 at 1:30 pm. 1-3 p.m. 50 cents for materials. Region at a luncheon on Oct.
threat largely as a Jewish one. prisoners of war because Dr.
and new. Call before Saturday to RSVP and for directions. Donation: JCC members $3, non-members $5. buffet and great drinks. Donation: $1 plus your own fare. interesting activities and programs input is welcomed. Afterwards, plan to go out for a bite to eat. Lose Weight The Simple Way! tots when thay and than you did whan thoy started? BAI LIN TEA Is tba solution. to work by world famous mlcroblologls ta. Don't hasl ta ta. order yours wh Ila supply lasts. to an even worse persecution." were sent to their death." close to the Likud party. sibility for this dual failure." John Paul II were "shocked"
be prepared to deal with that. ing, and not shrill attacks." delegation will participate in a ne\ for communications,"
done to help the Jews. a new dimension to your life. "just a slogan," Peres said. Couvert $12.50. Payment must be no later than Oct. 9. The minimum commitment is a $250 Certificate. movie critic. Refreshments will be served. All are welcome. held at the Fountains South Clubhouse at noon. the season on Wednesday, Oct. 14 noon at Temple Israel. be, "You Have to Love Israel When You Visit It." vited to attend. Dues may be paid at the door. music and stories by Sophia Langbort. Forest Hill Boulevard, on Monday, Oct. 19, at 11:30 a.m.
Peres in New York last week. ed by Israel and Hungary. family at the British Library. to wear a military uniform. 25, from 11:30 a.m. to 1 p.m.
,iM!L^ Oct. 9 6:39 p.m.
the festive holiday of Sukkot. the last day of Sukkot. Julius, 72, of Poinciana Drive, Lake Worth. Security Plan Chapel. Wet Palm Beach. the first paragraph of each.